The Bayhawks breeze through the first of a two-game series against the Thunderbirds last night. The Erie Bayhawks hosted the New Mexico Thunderbirds on a chilly Thursday night at the Tullio Arena. 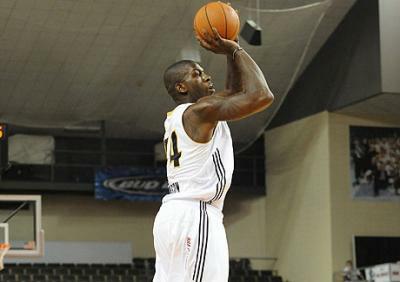 Bayhawks sensation Ivan Johnson put up 37 points in a 125-100 Bayhawks victory. Johnson was the most significant presence of the evening scoring from the inside, outside, off the fast break and the foul line. Johnson concluded the game with a game high of 9 rebounds. Kyle Goldcamp contributed a career-high 19 points (14 in the first quarter) as well as some key rebounds that enabled the Bayhawks to run the floor almost every other possession. Guards Blake Ahearn and Tasmin Mitchell were running on New Mexico all night as they were ripping rebounds down and pushing the ball down the floor in some cases going coast-to-coast, and other cases dishing to a teammate exhibiting great transition chemistry. Ahearn and Mitchell finished with 18 and 13 points respectively. Another key to last night's victory was their foul shooting—the Bayhawks shot an impressive 84.2% from the foul line. Even during the final push by the Thunderbirds to achieve some scoring momentum, they could not keep the Bayhawks off the foul line only extending their lead and propelling them further out of the T-birds' reach. The Bayhawks are currently in the midst of a hot streak winning 12 of their last 15 and posting an overall record of (21-9), one game behind the Eastern Conference Leading Iowa Energy. The Bayhawks and the Thunderbirds are set to meet again at the Tullio Arena on Saturday February 12th.